Structurally demanding applications often require that the polymer perform under multi-axial loading conditions, dissipate substantial energy during impact or other excessive loads, provide long-term durability under mechanically and thermally cyclic loads, and perform these actions in chemically aggressive environments. While at Umass, I have developed a number of facilities that enable us to probe the mechanical response of polymeric materials over a broad range of stress states, strain rates, and environmental conditions. Some of these facilities are truly unique. Integrating the use of these facilities in controlled studies allows us to probe new structure-property relationships that ultimately enable us to predict the response of existing materials as well as provide guidance for new materials development. My research initiatives have two primary thrusts; mechanical characterization of polymers and polymer-based composites, and new process routes to make mechanically superior polymers and composites. In both cases we have developed capabilities to probe polymer properties (e.g., multiaxial test facility, ultrasonic spectroscopic, instrumented impact test facility) as well as process materials with novel methods and properties (e.g. scCO2 fiber drawing facilities, scCO2 extrusion facilities, scCO2 compression molding facilities). Although the effects of deformation rate and temperature are well understood in polymeric materials, relatively little is known with regard to how the alterations in loading conditions interact with the molecular architecture and/or morphology to alter the failure mode and corresponding failure energetics. This is due, in large part, to the lack of available data where these parameters are systematically studied in a controlled fashion. Our research involves testing hollow cylinders of candidate materials in a specially modified bi-axial test facility. The simultaneous application of internal pressure, tension, and torsion to this geometry allows independent control of strain rate, test temperature, and state-of-stress (i.e., loading condition). Moreover, compared to other methods, this method allows for a broader range of stress states to be interrogated, it allows for the continuous interrogation of stress states, and uses only one specimen geometry. The latter is important since it insures that one thermal history and morphology can be interrogated at a time. Our interest here is to develop tools that allow chemists, physicists, and engineers the ability to predict the nonlinear viscoelastic properties of polymer glasses from details of the molecular architecture. Initial studies on model epoxy networks showed that two molecular parameters that control the rubbery modulus of the network above the glass transition (Tg) actually affect the Tg itself and the yield stress (σy) in an identical fashion. These parameters include the molecular weight between crosslinks (Mc) and the crosslink functionality (fc) and were incorporated in a constitutive model for the yield response under multiaxial stress states. This model formally merges two previous models for yield; one incorporating stress state effects and the other incorporating rate and temperature effects. Further, this model allows for subtle molecular extrapolations (through Mc and fc) but new architectures require new experimental measurements. Further studies have interrelated these to the fracture toughness of these resins. Recently we have been able to generalize the concepts much further and have shown that the yield response is a governed by two physical parameters that, in turn, are related to the molecular architecture and can be predicted using molecular modeling routines. The first parameter, Tg, is reflective of the network stiffness (including backbone stiffness and crosslinks). The governing parameter is the cohesive energy density (Ec) which describes the cohesive strength of the glass, and is intimately related to the solubility. 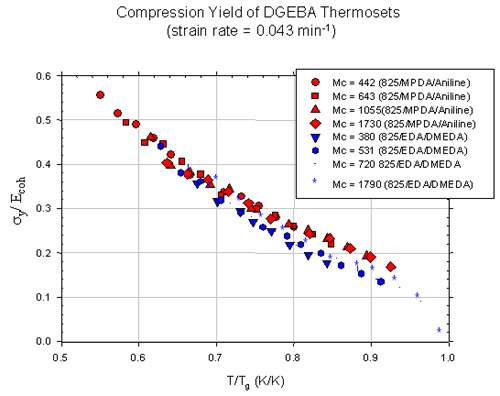 The figure to the right shows the compressive yield stress normalized by Ec plotted against the test temperature normalized by the resin Tg for four different crosslink densities of an aliphatic backbone resin (blue) and four crosslink densities of an aromatic backbone resin (red) tested over a range of temperatures. It should be noted that both axes are dimensionless. 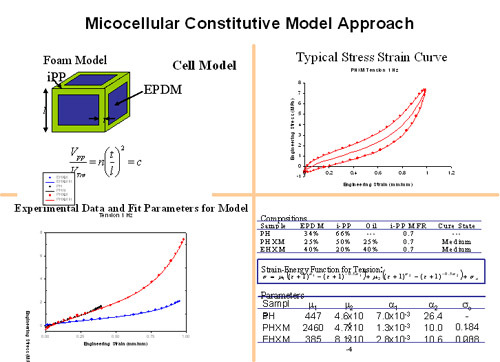 More recent studies have allowed us to formulate a dimensionless yield model that incorporates, alterations in stress state, strain rate, temperature, and molecular architecture (through these two governing parameters). The results thus far have shown our model accurately collapses the response of more than 9 different molecular architectures. Although rubber-toughened polymers are commercially common, there is still considerable controversy with regard to what the actual toughening mechanisms are and how the contribute to the overall energy dissipation. There is a quite lively discussion with regard to this issue since accurate understanding is crucial to the development of predictive constitutive models for mechanical properties. Our initial efforts in this arena have been to experimentally evaluate recently proposed models presented by Bucknall for predicting rubber particle cavitation, and subsequent yield of the cavitated matrix. These constitutive models are important to validate or evaluate since they provide critical information necessary for optimizing soft-particle modified systems including particle size and concentration. Direct evaluation of these models using fracture or impact testing is difficult since the stress states and magnitudes vary greatly as the crack tip is approached. In contrast, our multiaxial facility provides a method provide a uniform far-field stress and allows for higher hydrostatic tensile stresses than that found in uniaxial tensile tests. We used this facility in bi-axial dilatometry studies on rubber modified epoxies, we investigated the multiaxial yield response of pre-cavitated epoxies made by a novel process method, and we studied the process of cavitation directly by in-situ lazar light scattering studies during multiaxial testing. More recent investigations have shown that a generic damage pattern appears in a broad range of rubber modified materials well before gross yielding is observed. This pattern appears shortly after particle cavitation and evolves with increasing load. The pattern appears as regularly spaced configuration of cracks resembling a doubly periodic array. Although the pattern is generic, the microcrack size and crack density were shown to vary with differences in macroscopic toughness. Current numeric studies using complex potential Greens functions have shown that these patterns are energetically favorable, and there size and number density are related to the intrinsic toughness of the matrix. Results from the numerical analyses are shown in the graph. The results show that, for a given vertical crack density (shown for each color separately) there exists a unique horizontal density that produces a minimum in the stress intensity (normalized by both crack length and far field stress). 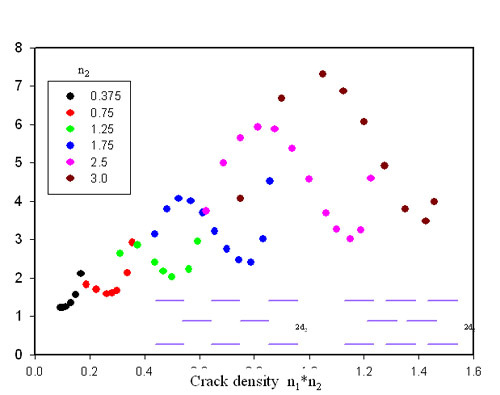 It appears that the materials evolve crack patterns with these lowest stress fields and their relative densities are associated to the toughness of the resin (i.e., value of the normalized stress intensity for a given crack density). Current research is examining the effects of non-spherical impact modification. Their have been a number of questions raised with regard to the mechanical response of nano-reinforced composites. Because of the tremendous surface area that these systems generate together with their potential to alter the molecular confinement at the interface, questions arise as to whether the reinforcement alters the physical state of the polymer which, in turn, affects their mechanical behavior. Studies on polymer systems above their glass transition (Tg) have been relatively consistent, but reports on glassy nanocomposites have shown contradictory responses. Another issue not widely discussed in the literature is associated with toughening mechanisms using reinforcements with this length scale. In particular, some models suggest that the particles are too small to activate dissipative mechanisms like cavitation or particle debonding. If this is true, particle-particle interactions may be necessary alternate routes to achieve toughening. Our initial studies on epoxy networks reinforced with organically modified nanosilicates showed that intercalated systems can show an enhancement in fracture toughness, but the increase occurs primarily by increasing the fracture surface area during crack propagation (i.e., increased roughness of the fracture surface). We also found surprisingly, no increase in the compressive modulus of these materials. This was attributed to microbuckling of the silicate sheets observed in the post-yield regions of the composites. Later we utilized our scCO2 laminating facility to fabricate a nanosilicate reinforced glass with a 40 (wt%) nanosilicate reinforcement. This produced a material made up of 100% intercalated morphology and can be thought of as a nano-laminate (see TEM). Since this composite has all of its polymer in confinement, measurements of alterations in the Tg should be more pronounced. For this modifier, no alterations in Tg were measured. Other interfacial modifiers are planned to study in this fashion. Additional studies with polyhedral oligomeric silsesquixane (POSS) modified glasses in (with E.B. Coughlin) showed a decreased Tg, decreased yield stress, and decreased fracture toughness with increasing POSS concentration. We have also started investigations with molecular scale reinforcements. Initially we considered how anti-plasticizers or fortifiers alter the physical and mechanical behavior of glasses. In particular, we want to determine the molecular requirements for effective reinforcement or fortification. In contrast to recent findings by others, we found that aromatic structures are not required for effective reinforcement. Current studies are focused on how these model fortifiers interact with model networks. As polymeric materials compete with and replace traditional structural materials, issues associated with their long-term durability become paramount. A major challenge that continually arises (usually in part failure) is our inability to predict the long-term performance of these materials. Many of the accelerated tests and methodologies used today are adapted from metals or other materials and can produce misleading and un-conservative lifetime predictions. Moreover, the relative ease of synthesis and processing of polymeric materials compared to the traditional alternatives has resulted in an exponential growth of new materials to choose from. Thus, it is critical that rational methods that properly retain the physics of physical aging, exposure, and degradation be incorporated in the accelerated tests methods. Our initial efforts focused on introducing new in-situ methods to monitor the mechanical deterioration that occurs during cyclic fatigue of these materials. The methods include monitoring the dynamic viscoelastic behavior, the energy density evolution, and the irreversible deformation during the fatigue life of the material. Initial studies have shown that both the mechanically dominated and thermally dominated regimes can be detected using this technique before failure occurs. Moreover, results have shown that in the mechanically dominated regime, these materials show evidence of mechanically induced embrittlement. Additional studies have been conducted to extend the concepts of tensile dilatometry to include fatigue dilatometry to monitor effective volume changes that occur as a consequence of damage during fatigue of these materials. 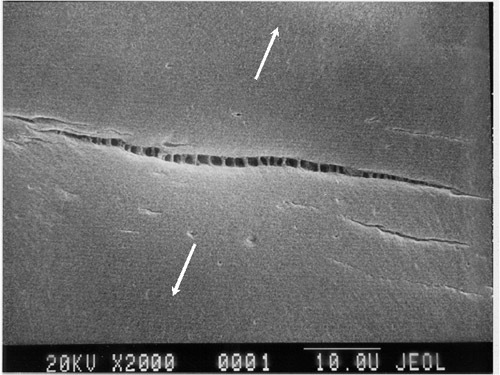 The methods developed in II.1 were adapted in a systematic investigation into the fatigue damage mechanisms and kinetics of mechanical degradation. Our studies have shown that these materials damage in a regularly spaced pattern of crazes whose size and number density evolve with increasing fatigue cycles. In this study, we have quantitatively characterized the damage density and its evolution using an image analysis system. Finally, the damage evolution is used together the in-situ measurements to describe the energetics of craze growth. Current interests include studies to identify how the energetics of craze evolution change with alterations in resin morphology. It is well known that polymers can craze and fail prematurely in a brittle fashion when exposed to a normally acceptable tensile stress and certain surface-active agents. The surface-active agents are typically low molecular weight surfactants or liquids/vapors which are normally poor solvents for the polymer affected. Although this has been qualitatively and semi-quantitatively understood, predictive constitutive models are still not available. Further, many of the models proposed today, either lack the mechanics or physics to apply to relevant industrial problems. Initial efforts in this area have been to study how the stress state and polymer orientation affect the craze threshold and craze development in polycarbonate films. In this effort we also conducted initial studies to evaluate a criterion for craze initiation proposed by Gent. More recent efforts have focused on evaluating the hypothetical mechanism proposed by Gent which is based on an extension of the Flory-Huggins equation to incorporate a dilatational stress component. The basis of Gent’s hypothesis is that localized swelling can occur at surface flaws where the locally high stress causes a local change in the polymer solubility enabling the otherwise poor solvent to absorb into the polymer. Our approach involves monitoring the contact angle between a surface active agent and a polymer surface while the polymer was subjected to stress. This approach was selected because it is anticipated that once the threshold stress is reached, a discernable change in contact angle should occur corresponding to the change in polymer/solvent interaction. This method has many advantages to identifying a threshold stress over other studies in that it avoids ambiguities associated with the kinetics of solvent diffusion followed by craze development and length scale issues of identifying when a craze actually initiates. 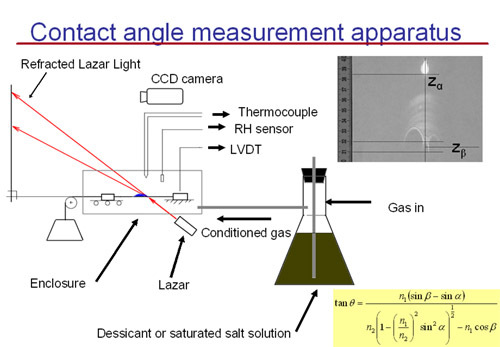 In order to use this approach, a new method using lazar refraction had to be developed to monitor contact angle (see figure above). Our method has proven to be about an order of magnitude higher precision than that of conventional methods. We have also extended our studies to include studies on the effects of molecular architecture on the fracture behavior of aged polymer glasses. Although is work has just started, our efforts here are to identify how compositional changes in BPA based PC alter the fracture response of the glass. Another commercially important class of materials includes thermoplastic elastomers. In general, these materials exhibit many of the deformational characteristics of their crosslinked crosslinked counterparts, but are thermally processable. One of the more commercially important and morphologically complex materials in use today include composite thermoplastic elastomers made up of dynamically vulcanized EPDM domains dispersed within an iPP matrix. Typical formulations consist of roughly equal parts EPDM and iPP with additional low molecular weight oil introduced for processing. The various elastomeric properties of these systems is altered by degree of crosslinking in the EPDM, altering the size domains of EPDM, changing the Mw of the iPP and concentrations of each constituent. Initially we evaluated the effects of EPDM domain size on the tear resistance of these compositions. as well as characterizing their solid-state rheological behavior as a function of composition. During this same period, questions were raised in the technical community as to what the origins of elastomeric behavior arise from in systems where the continuous phase is relatively rigid. To address this, we proposed that the composite elastomer might behave similar to that of a foam, except that the cells of the "foam" be filled with a crosslinked elastomer (see micrograph above right – raised regions are iPP and depressed regions are EPDM). The approach involved modifying a strut model originally proposed by Gent and Thomas and resulted in a closed-form model to predict the elasticity, hysteresis, and permanent set. It also provided an alternate explanation for the origins of hysteresis and permanent set (i.e., arising from plastic hinge formation in the iPP). We have also started efforts on EP random copolymer thermoplastic elastomers. In these systems we report many of the same unusual solid-state rheological characteristics first reported by Sternstein. We also the effects of crystallization on the resulting mechanical response of these systems. Most recently efforts have started on characterizing the elastomeric response of a new class of S-EB-S tri-block copolymers. Simultaneous WAXD and SAXS show that randomly configured grains of cylindricial micelles distort to 45-51o angle under high strain with concomitant strain induced crystallization. Studies are currently underway to develop a hierarchical model for the deformation of this class of elastomers. 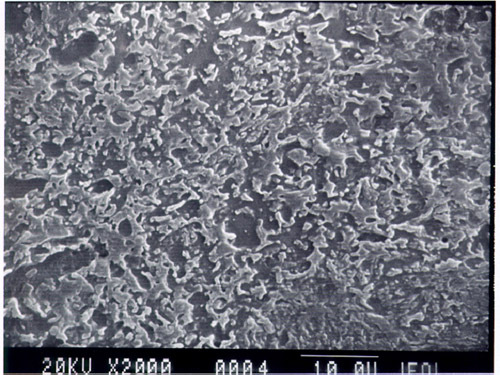 The response of polymer films are quite often dramatically different than when they are deformed in the bulk. This is due to both the film morphology and the highly unconstrained (plane stress) condition during deformation. This usually results in a significant amount of irreversible deformation and dissipated energy during the tearing process. Our efforts in this research are to study how film composition and loading conditions alter these responses. Large-strain studies on oriented linear low density polyethylene (LLDPE) film under biaxial loading conditions show that strain localization occurs and produces a dilatational band which mechanically resembles a craze but is morphologically distinct. Closer inspection indicates that the dilatational band is actually associated with the same phenomenon that produces necking in uniaxial tests. Our work in this effort involved developing an experimental setup (based on blister tests) to monitor the energetics of dilational band growth. 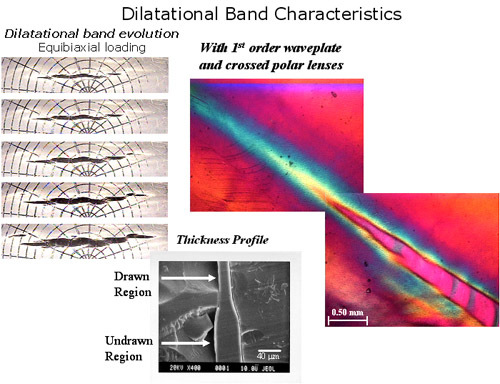 The sharp boundary between the dilational band and the film together with the self-similar evolution allows for fracture mechanics methodologies to be used develop a constitutive model for the dilational band evolution. An interesting side note of this approach is that it results the rare use of the M-integral as opposed to the more conventional J-integral. More recent studies have focused on determining what relationships interrelate the tear resistance of a film to its cutting resistance. Although recent standards have been developed to evaluate the tear resistance of films using method of essential work, our results show that additional geometrical limits should be imposed. Our research in this arena exploits the fact that scCO2 is an inimical solvent for most polymers but effectively plasticizes many of them. We exploit this feature and use scCO2 as a "reversible" plasticizer in both solid-state and melt-state processing of polymers and composites. To that end, we developed a number of unique facilities that allow us to draw fibers, solvent weld films, compression mold composites, and extrude intractable polymers and nanocomposites in scCO2. V.1 Drawing Fibers in scCO2. Under highly permeable conditions, drawing polymeric fibers in scCO2 has similar effects to that of conventional solvents except that once the pressure and temperature are removed the CO2 diffuses out of the polymer. Under non-solvent conditions, the hydrostatic pressure superposed on the draw stress suppresses failure and allows for higher draw ratios to be achieved. In most cases, we see a combination of these two conditions and altering temperature and pressure allow us to promote higher draw ratios, enhance crystallization and overall orientation. Our recent efforts are focusing on using scCO2 as a transport medium for enhancing other properties. We have been able to fabricate unique fiber reinforced composites using a specially designed reactor that allows us to put a normal force on a fabric perform during the polymerization process in scCO2. By introducing a semi-crystalline fiber mat, monomer, and initiator, we polymerize within the fiber, across the fiber interface, and around the fibers to produce truly unique composites. 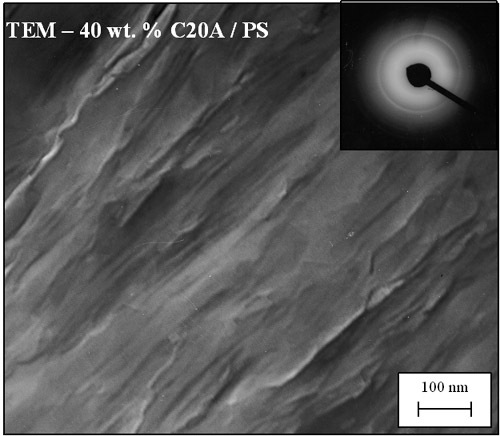 Since the CO2 only permeates the amorphous phase, the crystalline morphology in the fibers template the deposition of polymer during polymerization. 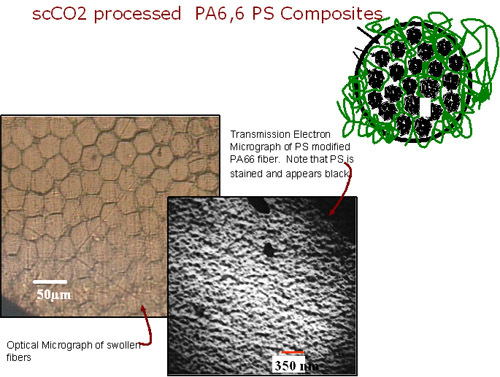 The figure above shows an optical cross section of a PA6,6 fiber reinforced PS composite together with a TEM of a fiber where the PS is stained. Note that the fibers expand in cross section and change from a more circular to hexagonal shape as they fill volume in the composite and swell with polymer. Additional studies show that the amorphous orientation of the fiber is reduced by the amount of fiber swelling but the crystal structure in the fiber, as well as degree of crystallinity and crystal orientation are unaltered.